Soils vary greatly in their ability to produce merchantable volumes of pulpwood, sawtimber, veneer, poles, piling or other wood products in a reasonable period of time. The old saying "plant your sorry, worn-out acres to trees" has been followed by many an unwary landowner. In fact, as with any other crop, the better the land, the more productive the forest. Landowners must be aware of soil factors that affect forest production before investing in forest regeneration or management. The collective influence of soil factors will determine the site index for a particular tree species on a given soil area. Site index is the total height to which dominant trees of a given species will grow on a given site at some index age, usually 25 or 50 years in the Southeast. Dominant trees are the tallest trees in the stand. If it is stated that an area has a site index for loblolly pine of 70 feet at 50 years, then we expect loblolly seedlings planted on that area today to be 70 feet tall in 50 years. Index age and tree species must be stated when referring to site index because the site index of one species will be different from the site index of another species growing on the same area. There IS a close relationship between site index and timber yield. Volumes of merchantable wood increase with improvement in site index (Table 1). Table 1. Relation of site index (SI) to timber yield of managed loblolly pine. 1 Thousand board feet (International Rule) of sawtimber per acre assuming recommended thinnings are completed. 2 Cords of pulpwood per acre removed as thinnings. 3 Value per acre assuming $245 per MBF and $15 per cord. Topsoil Depth. The depth of the uppermost soil layer is a critical factor affecting tree growth. Topsoil is highest in organic matter and nutrients, is usually well aerated and drained, and allows maximum root growth and root penetration. Soil Texture. The proportion of sand, silt, and clay in the topsoil and subsoil layers is called texture. Sandy soils are normally very well drained and often lack nutrients due to constant leaching loss. At the other end of the spectrum are the pure clay soils comprised of very small, fine soil particles. Subsoil Consistence Class. Consistency of the subsoil layer is another important factor in forest soil productivity. The combination of soil-sized particles and the physical and chemical properties of each individual particle type in a given soil determine the soil's consistence class. Limiting Layers. A layer which restricts the downward penetration of a tree's root system will reduce tree growth in direct relation to the depth of layer. In rare instances, a limiting layer may increase site productivity, such as on sandy soils where the layer may retard leaching of nutrients and in­ crease available moisture. Fertility. Southern pines grow over a wide range of soil fertility levels. Fertilization is normally not recommended early in the rotation except in the case of a critical deficiency of a major nutrient such as phosphorus. A soil test prior to site preparation will alert a landowner to critical deficiencies. Research has shown conflicting results in forest tree response to nitrogen fertilization, particularly early in the rotation. Growth may be suppressed if the fertilizer increases the growth of competing weeds. Best results from early fertilizer use arise in combination with herbicide or mechanical control of competing vegetation. Late rotation fertilization done five to eight years before final harvest increase timber yields in many situations, but may not be economically practical. Internal Drainage. Few tree species can grow in soils which are constantly wet. Drainage can be improved in some cases by tilling, ditching or adding bedding as a site preparation method. Site index can be determined by two methods. One method is to find on the area in question several dominant trees of the species of interest or a species with a known conversion factor to the species of interest. 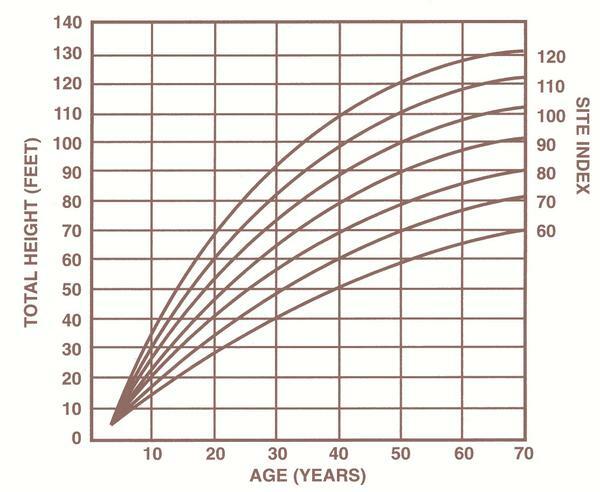 Using accurate age and height measurements, read the site index from a graph showing height over age curves for that species (Figure 1). The second method of determining site index is based on physical characteristics of the soil. Tables giving site index by this system are available for several important species. Necessary information about the soil includes depth of the topsoil and plasticity of the subsoil. In deep sands, the depth to a finer-textured horizon and fine particle content of that horizon are used instead of topsoil depth and subsoil plasticity. Site index can be calculated with reasonable accuracy for virtually any commercial tree species. A landowner should consult a professional forester to evaluate the site indexes for the tree species on a particular property. Site index information is included in the comprehensive soil surveys completed within the last few years or in progress in many counties. Your local Natural Resources Conservation Service can provide information related to soil surveys. Selecting the proper tree species to manage or plant on a particular site involves several steps. Determine objectives. If timber production is the major objective, select a species that will economically produce timber products. If wildlife, recreation, aesthetics or other uses are the objective, select species accordingly. On many tracts, several uses may be compatible. Select species with a proven track record in terms of growth and acceptance in the local market. If two or more species could be selected and timber pro­ duction is the major objective, select the species that will yield the greatest dollar return in the shortest amount of time. In most cases, this means selecting the species with the highest site index. Landowners should invest only in those species on those acres capable of producing acceptable economic return. Returns will vary with investment, species, and site quality. Foresters can provide information including site quality, yield, and projected economic returns before deciding which, if any, species should be managed on a particular property. For more information on forest soils, contact the local Extension agent, North Carolina Forest Service, or the local Natural Resources Conservation Service office.